Danemark mit Holstein und Lauenburg. 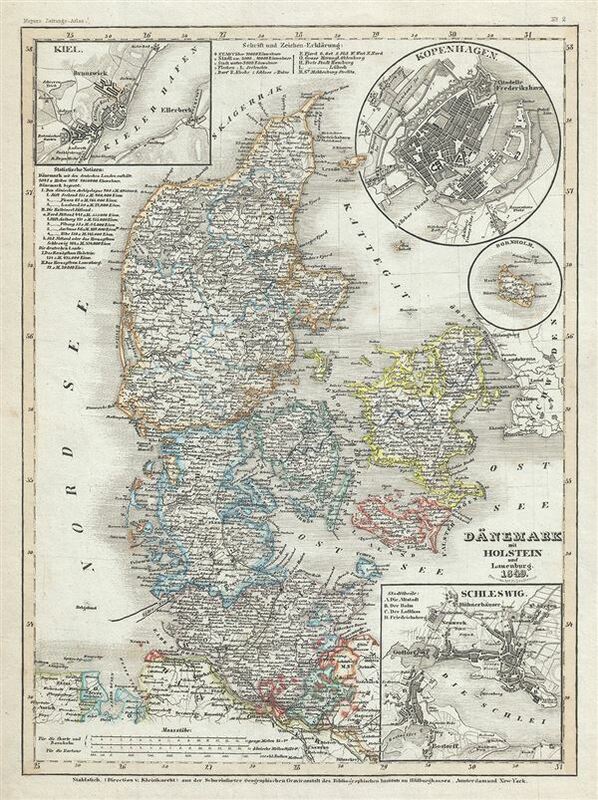 This is a scarce 1849 Joseph Meyer map of Denmark. It covers all of Denmark inclusive of the Duchies of Schleswig and Holstein. Numerous towns, rivers, roads, mountains and other important topographical features are noted throughout. An inset in the top left and right quadrants details the cities of Kiev and Copenhagen. Another inset in the bottom right quadrant details the city of Schleswig. The Island of Bornholm is also included in an inset. During the time this map was made, Denmark was in the midst of the First Schleswig War between Prussia, Germany and the duchies of Holstein and Schleswig against the Kingdom of Denmark. In 1848, when the king of Denmark, Frederick VII, proposed that the Duchies of Schleswig and Holstein be formally recognized as part of the Danish Kingdom, the predominantly German population of the two duchies rebelled for a free constitution, resulting in war. Denmark ultimately won the war and retained control of Schleswig-Holstein. This map was issued as plate no. 2 in Meyer's Zeitung Atlas. Although all the maps in this atlas are not individually dated, the title page and maps were often updated while the imprint with the date was not, causing confusion to the exact date for some of the maps. Moreover some maps in the atlas were taped in at a later date as an update to the atlas. We have dated the maps in this collection to the best of our ability.